Welder and crew; If this post should be relocated I'll rely on you folks to move it somewhere else. I didn't know IronWoodTuna but this is along the same lines as his memorials here, posting here is not meant in any way as disrespecting his area of the site. An old family friend's son "passed over the bar" a year or so ago, not all that unexpected even though he was a young man because of a heart condition from birth that qualified him to apply for a donated organ that didn't get to him before his quit. His Dad, whom I've known since the mid 60's, wanted to have a small memorial built to mount on a granite rock in the father's yard and after listening to him describe what the memorial would need to look like, I realized that I didn't know anyone who'd build what was needed. Its not all that big a deal, but in our area there just wasn't anyone that I knew who'd be likely to take the memorial project on. 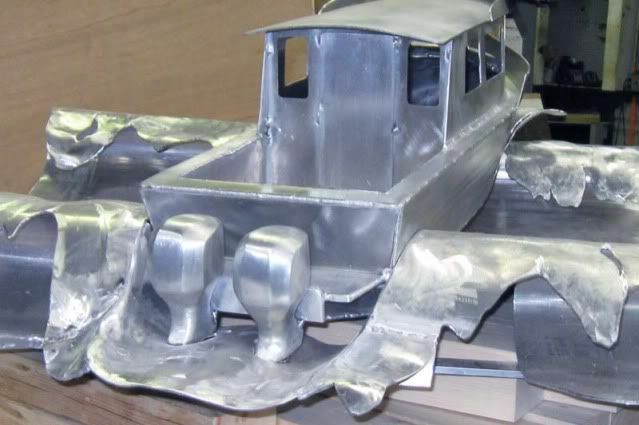 My friend's son was a six pack charter fisherman (offshore hook and line guide) he owned a 30' twin Honda 150hp outboard, welded aluminum boat and his father wanted to have a copy built 30" long as remembrance. 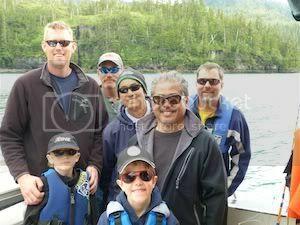 The son, whom we'll call Skipper John B, fished the Cook Inlet for salmon and halibut probably didn't make clients throw back a decent rock fish or large enough cod if one climbed aboard. 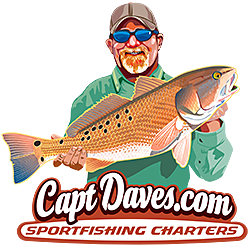 The weather in the Gulf of Alaska can be a little lumpy and its normal to run in after a day's fishing with an offshore breeze moving against your heading, and if the tide were ebbing, a short break forms that covers the course to the few harbors. I kind of had that idea from Skipper John's Dad when we talked. So I volunteered to give the project a try; this is what I built. It's posted here since technically it is a "metal boat" even if only 30" long and made of 0.080" and 0.060" 5052, with 0.100" and 0.125" "water". 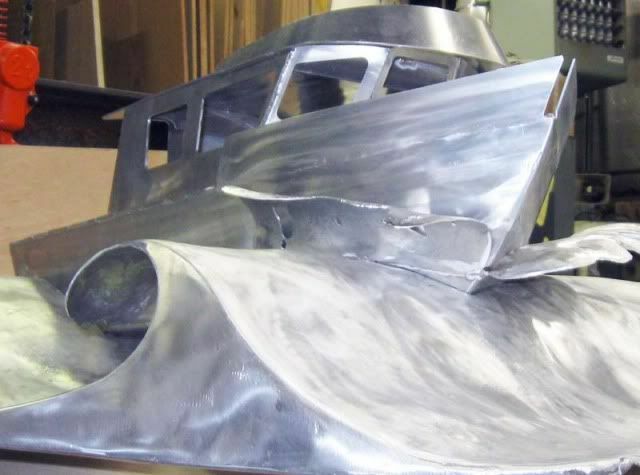 Its definitely an Aluminum Alloy Boat, even if its not completely done in these photos. 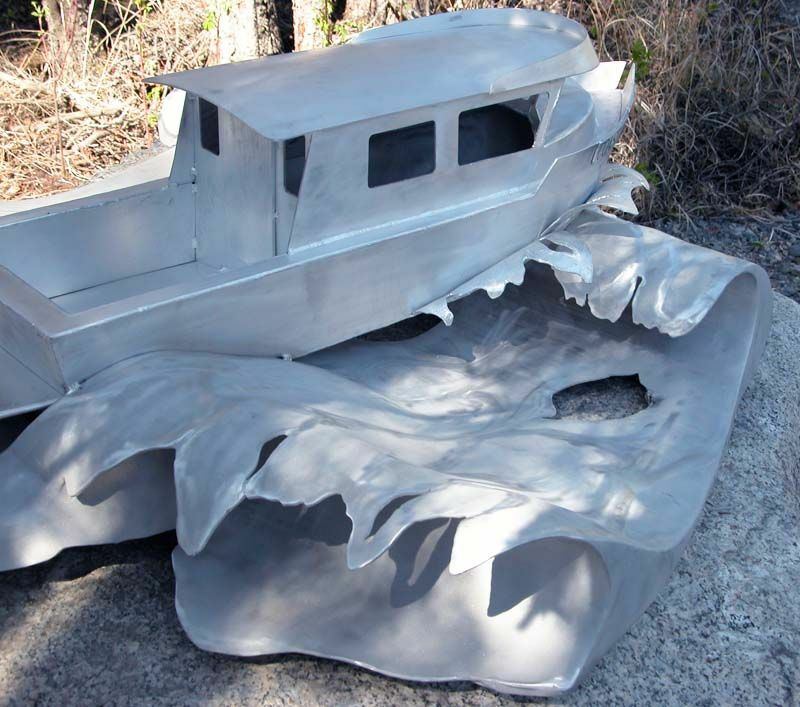 The brow of the cabin is too full forward, the bulwarks still has too much convex and turns up too high, there aren't any rails or fishing gear because in scale those would be wire sized and a bit fragile for this outdoor display, but details or not; here is the Metal Memorial seascape to a fellow welded aluminum boat fisherman/guide from the Gulf of Alaska. This is actually the 'back' of the [mostly finished] piece since the visitor to the family's yard will come to the memorial from opposite the camera view. The rock sits in between trees in the yard so getting behind the rock to see this view won't be as common- but it helps to give the memorial some context as we view it here. 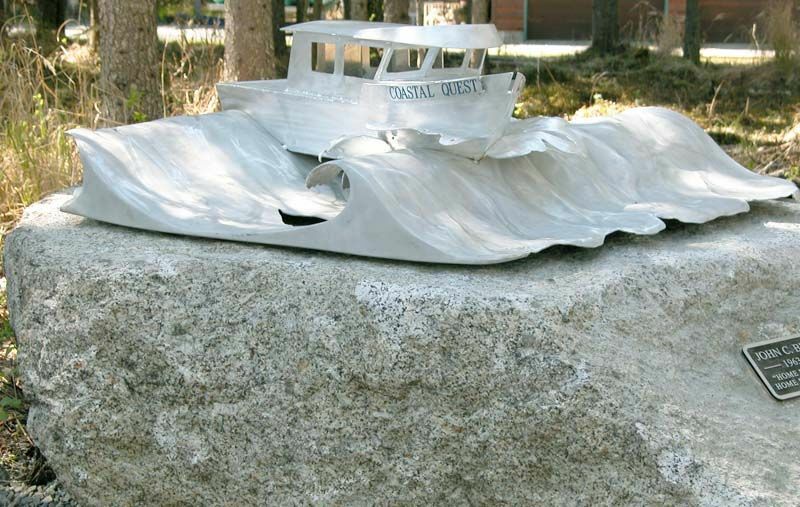 This is the 'front' of the piece, the boat is running into a short breaking sea which is running away from the viewer so the boat is almost head too the waves. When designing this little boat I followed the Skipper's Dad's ideas about orientation and he liked the boat running into the visitor's view bow on. 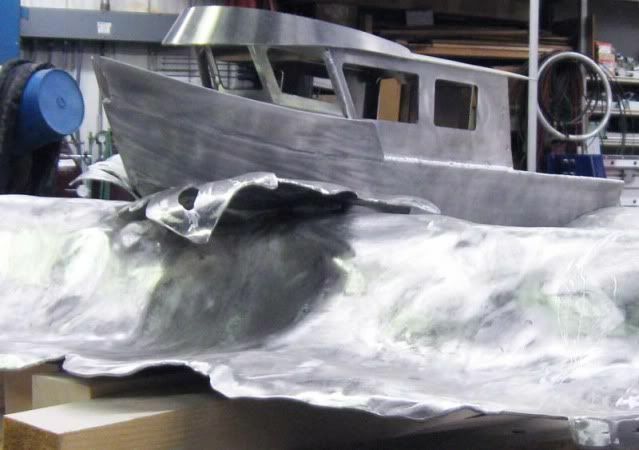 You've gotta leave me a little room here, it turns out the aluminum waves and bow wash aren't as easy to make as 30" long welded aluminum boats; and the boat is kind of a work out as well. This view is below what would normally be a line of sight and somewhat 'behind the rock' but included here for the metal working inclined. 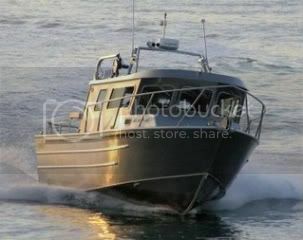 Again, dropping down to bent knees level for our line of sight, the idea of the seascape is of the boat 'running in', which in this neck of the woods means the boat is headed north by northeast from somewhere in the Southern Cook Inlet against a North blow pushing an ebb tide. 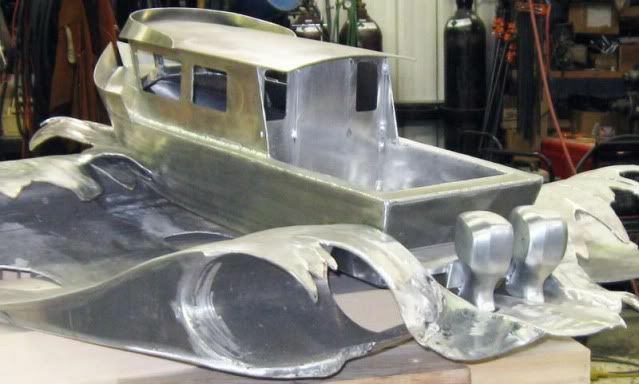 A man wouldn't think a bow wave was as much work as it turns out to be, until you go from the pencil on paper to the sheet metal, then instead of a few strokes with your hand you have to roll, bend, wheel, texture, form and fiddle with sheet metal until there is some resemblance to 'water'. 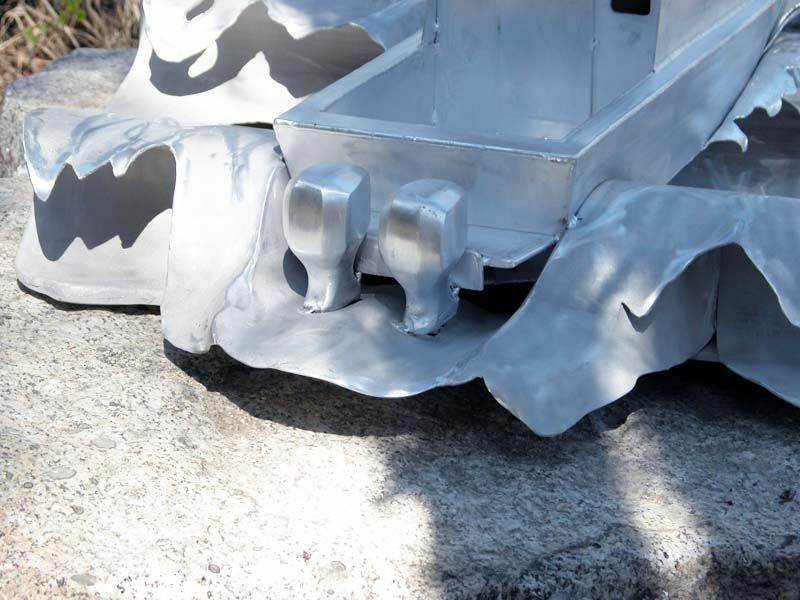 A little more detail of the stern view, not one that will be seen much by visitors but I ended up having to make the piece more complete than I originally imagined because the overall look seemed incomplete without the stern, a wake and all. 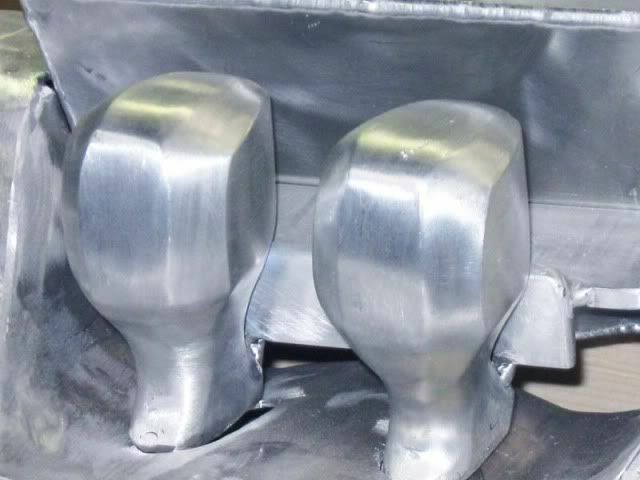 The outboards are not hollow, I had to carve them from solid aluminum since my attempt to model that shape - in sheet making these small surfaces, then welding them- was too time consuming. The 'wake' aft the boat isn't quite finished; some of the transitions and edging are not done, but the main ideas are here. Speaking of Honda Outboards, have you ever tried to get a machine drawing of these engines? If anyone has drawings of these engines I'd sure like to have a copy of the files, it was extremely hard to get any accurate modeling info- dimensions and other details seem a very closely held 'secret' of Honda! I couldn't find any 2" thick x 4" bar to cut these from so I cut outlines of 1" x 4" 6061 bar and beveled the centerline of the two outline blocks then welded them to make the 2" thick blanks. The rest is mainly hand band sawing and sanding - with some air die grinder and carbide burr carving thrown in. These little engines are mounted to a fairly reasonably replica of the stern mount on the original boat, which was well built, but lighter than I'd have preferred to make an engine cantilever. 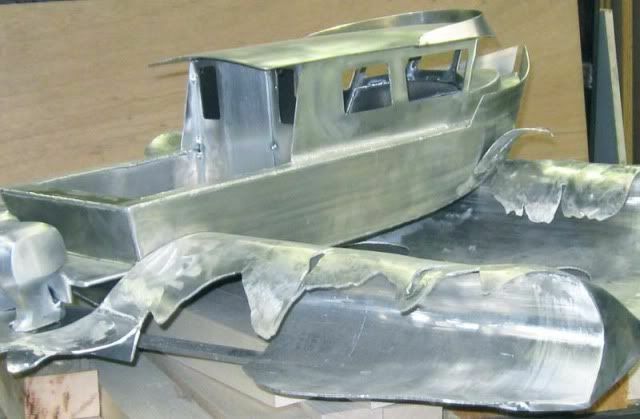 I tend to build my outboard powered boats with a hollow nacelle [engine mount or bracket] that often has planing bottom too, this boat's engines are on a pipe framed plate cantilevered off the transom but gusseted underneath to the hull stringers inside. 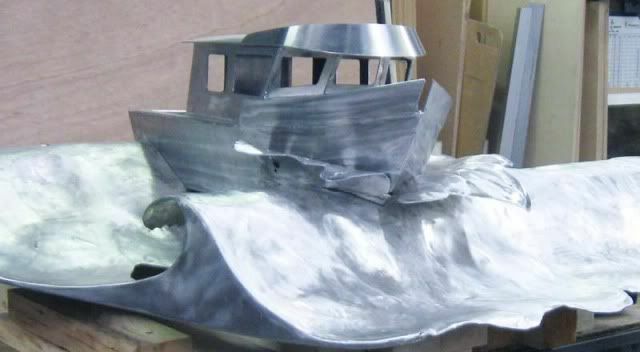 The overall metal work is not entirely finished but there are quite a few hours even to this stage regardless if it's only a 30" long boat. There''ll be another bit of bow spray going along the chine of the starboard side shown here, more or less filling some of the space between the waves and helping to 'wet' the line of the hull as spray will trail along dripping from the chines when a planing boat runs in a head sea. Windows will be filled from within with sheet plastic and the entire show will mount to the rock on some studs that a friend has kindly explained to me how to mount. Welding .060" and .080" boxes or tanks is one thing, but welding a hull of that material is more challenging especially when the welds are inside fillets. Outside edge-to-edge isn't as hard to weld, but the deck to cabin or trunk to deck welds are not up to the level I'd have liked to brought to the project. 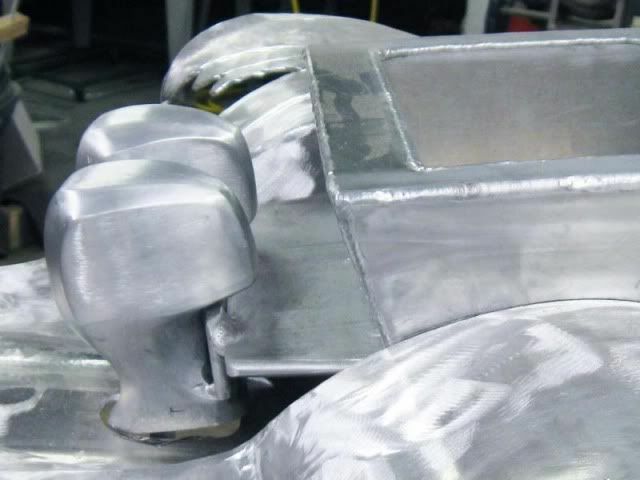 Looking back, I could have used a fusion tolerating alloy like 3003 where I didn't have to have filler but I'm not up to speed on those alloys and by the time I got the boat cutout and tacked, I was too lazy to go back from scratch with new material. Aluminum water sounded easy to make, [! ???? !] but I found it was a bit of challenge, in fact, it was more work figuring out what to do than the boat. 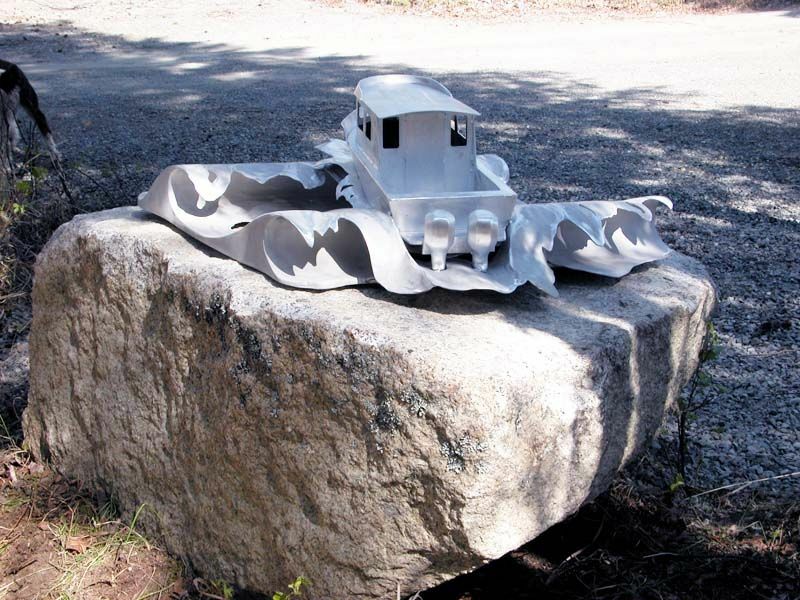 Of course, I've built plenty of boats, so scaling those ideas down to 1" = 1'-0" wasn't new territory, just smaller pieces. However, aluminum breakers turned out to be more than I'd bargained for. I guess if we just keep folks 10' back things will work out OK, its kind of like my spray paint jobs- any where outside 25' feet and they look "real dressy" - but they don't really hold up with a close inspection. I kind of let my alligator mouth volunteer my hummingbird 'stern' to do more than I figured. Just before this 30" boat I did a 14' er and if the level of effort that I've experienced follows any pattern: then its [proportionally] more work to build smaller than it is to build larger! I think a nice 20' skiff sounds like relaxing 'next' boat. 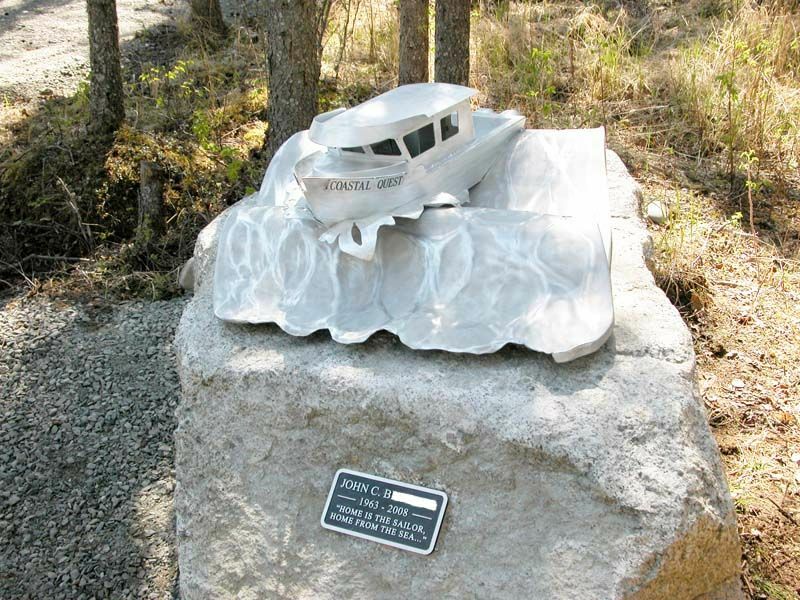 I've already mounted the cast aluminum plaque on the rock this past fall, following my friends' great step-by-step directions about metal studs in rock with epoxy and it worked fine; so, hopefully, this spring when things warm up a little we'll mount the "Coastal Quest" on its final mooring, in memory of her Skipper, John B.
I include this look at a welded metal memorial here as a memory of all the great guys who have welded alloy boats and fish the salt around their home ports, who have already passed, including Marty Macmillan. First off, my condolences to the family. Second, holy cow you are an artist! I can't believe the detail. You have done something huge! Anyone to receive that piece should be proud to display it to represent a lost love one. A true memorial. Job well done. Fantastic job, that is a great memorial, you should be very proud of your work. Great tribute to your friends son. Kevin it is beautiful . . . what a fitting tribute . . .
Skipper John B , may you rest in peace , God Bless you and your Family. Kevin , OH MY WORD, She is Beautiful . Please show us the finished monument when she is finished and in place. You SIR are a true friend , artist and Gentleman . You are welcome to put that post ANYWHERE on this site any time. I think Marty would be Honored to have this ART WORK in this Forum . Well done, Well done SIR. Simply amazing work. You have made a memorial That the parents of Skipper John B can remember their son by. I hope this is not out of line......... I imagine Marty smiling down looking at this piece of art too. Thank you for sharing. Grateful you are part of this site. Last edited by mojomizer on Sat Jan 16, 2010 11:54 am, edited 1 time in total. My condolences to you and Skipper John B’s family. Kevin, truly amazing work. As Lester mentioned, please do post a photo of the finished memorial. And I agree, I’m sure Marty would approve. Like the others have posted, Kevin, that is fantastic. Great welders truly are artists. What a tribute! Gentlemen, thank you all for the very generous remarks, I appreciate your welcome reception of the project, and well wishes for the family. When the memorial is complete and mounted I'll make sure I have pictures for the AAB.com site. I have poured over these photos Kevin and they are amazing, I would love to have ago at a project like this one day, as an office dweller I doubt I could achieve anywhere near your fantastic results. Really well done. Stunning work and my condolences to the family! Neat project, I am very impressed. A couple of questions, feel free to ignore if you don't want to answer. How may hours do you think you have into this project? My bet is alot! Also, you commented that you have built aluminum boats. Are you with one of the builders on the peninsula? Thanks for sharing this, it is a beautiful tribute. 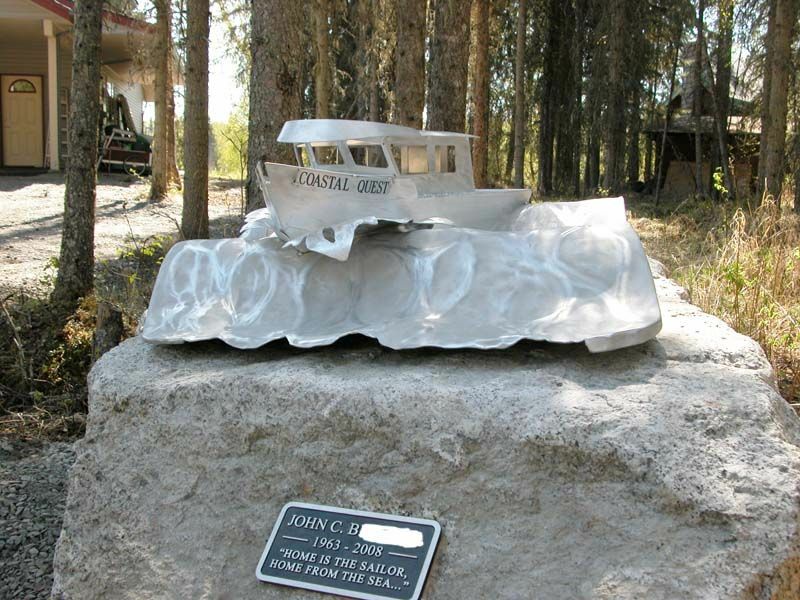 I really don't know how many hours are in the aluminum memorial because I built it as I could spare time over months. I would guess that I have a hundred hours but without being able to keep a shop setup, that is having to tool each time and clean up after any given work session to move back to our day job... well I've added at least 30% to the hours if not more. Those hours could be considered 'wasted' because if I'd been able to keep focused on the memorial I'd have only cleaned and set up once a day for a full 8-12 hours of productive work instead of half an hour or three here and there. 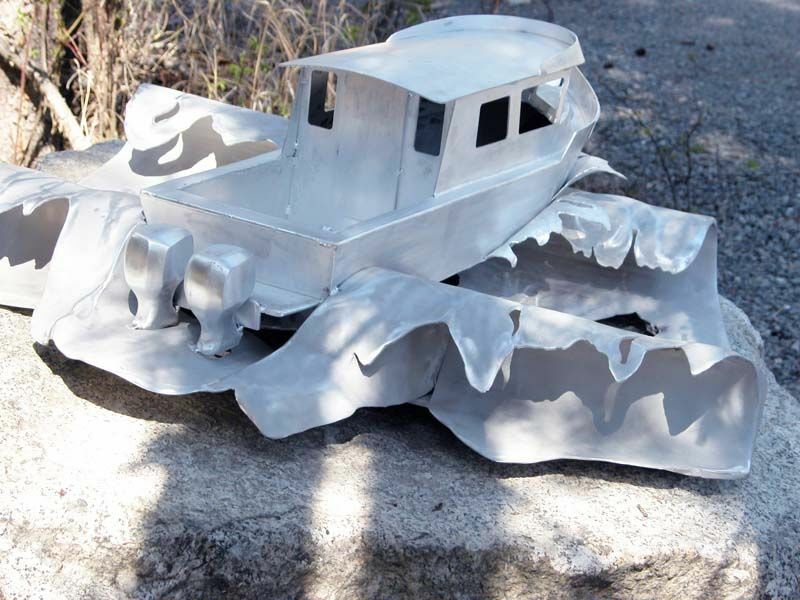 Figuring out the water was a little slow but I cut the boat on an NC router after drawing it in 3D modeling from some photos I took and the boat only took about 16 hours, the outboards took another 8- but the water ? I don't really have track of all the tries and experiments. Finding accurate drawing of the Honda 150's was more time consuming than I'd have ever believed. I'm not counting my tool up time. I had to build an English wheel; a planishing hammer frame, and practice with various hammers on a forming 'stump' so the learning time might have been the bulk of my effort? 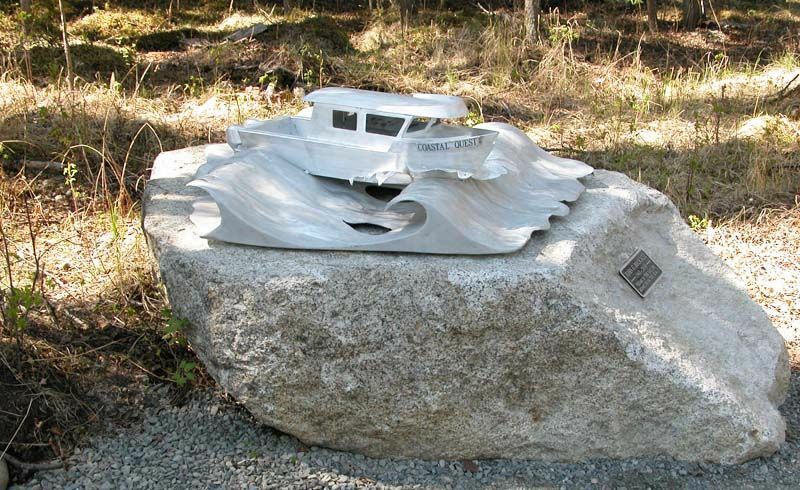 I built as Cape Kasilof Boatworks from 1977 to 1989/90, I don't build now, except family and friends' projects. After finishing the work on this memorial I got some weather and took an afternoon to get the Coastal Quest to her final mooring. 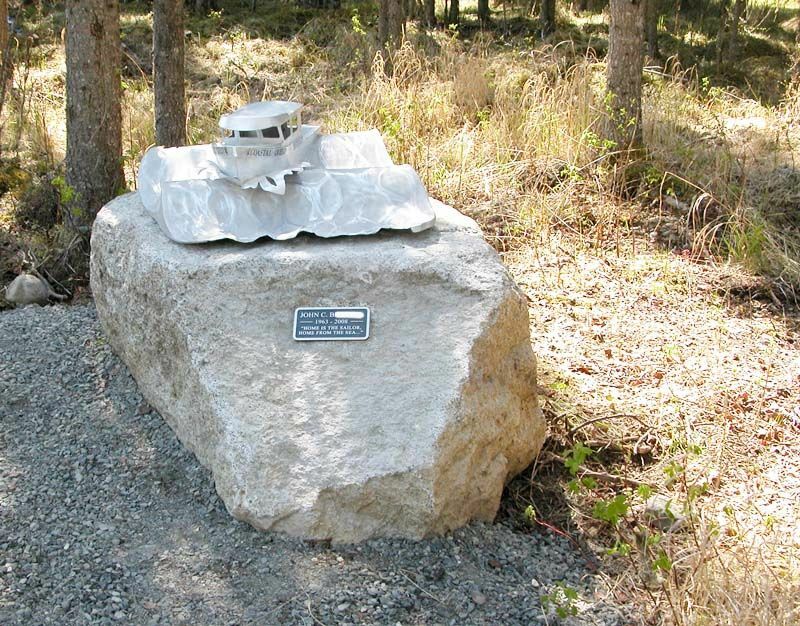 I used four SS bolts lined with a SS tube and bedded the four legs about 4" into the top of this rock using a hammer drill and some monument mounting epoxy. The piece is mainly viewed from these sides, above, but I'll show the 'back' too. if you were to compare photos you'll notice the wake is finished here and was shown unfinished before. I also filled in some spray trailing down the chine in the trough as I liked how that offset the hull there. Here is the final wake and outboards as they were finished. An overall look at the whole piece from the 'back'. And a low angle parting shot. In leaving this memorial to our Skipper John B. I wanted to remark about what I'd hoped to accomplish by doing this memorial. In the afternoon, here, a land breeze blows N.xNE 'down' the Cook Inlet toward the fleet of fishing boats running in to harbors or river mouths to land the sports and their fish. When this breeze blows the tops off an ebbing tide a short break forms that you just have to pound into it, take the weather on the bow, go slow and slog along to get back in. I saw that sea state at that time of day, as I recall it from so many years fishing here, as our remembrance of John and Marty. So I call this piece "Running In" in memory of all those who've passed over the bar before us. Kevin, very well done Sir, very well done. May we all have more true friends than we can count on one hand when we are old men! 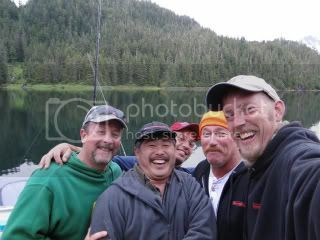 John C., may you have calm winds and fallowing seas as you set sail in all of Gods glory. What a beautiful memorial for your friend who left us way too young. Sir, I salute you and your efforts in a fantastic memorial, so warmly dedicated to your friend! I have been to many memorials around the world and have seen none finer or more meaningful! Your posting is well appreciated and it is hard to see the keyboard after reading all of the above. Respectfully, Captain Peter Walsh.